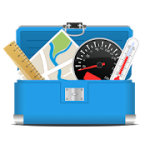 Carpenter Measure Tool Kit is a toolkit application with 23 great measurement tools and utilities such as ruler, spirit level, distance meter, speedometer, magnetic field meter (teslameter), seismometer, metronome and more. The application is compatible with all brands of devices (Samsung, Sony, HTC, LG, Huawei, Lenovo, Toshiba and others). However, not all models have the appropriate sensors to support all measurement utilities. It is mainly tested on Samsung, Sony, HTC, LG, Huawei, Lenovo and Toshiba.